Virgin Galactic's SpaceShipTwo soars over S.F. 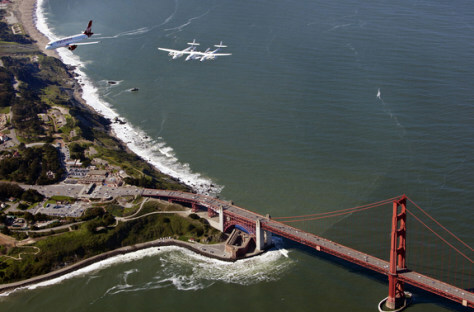 A new Virgin America A320 aptly named "My Other Ride is a Spaceship" flies in tandem with SpaceShipTwo and its mothership White KnightTwo over the Golden Gate Bridge on Wednesday. The aircraft landed at San Francisco International Airport as the first aircraft to arrive at the new $388 million, 640,000-square-foot Terminal 2.